2018 has been a crazy, food-filled, fun-filled year. We traveled all across South Florida and even as far as Italy all in pursuit of the best #foodporn this world has to offer. It’s safe to say we covered a lot of ground – and consumed a lot of calories – in the process. And we wouldn’t have had it any other way. So it only feels fitting to kiss 2018 goodbye with one last hurrah, and the prerequisite for any good hurrah in our book always involves delicious bites and booze. And speaking of fitting, we’re here to make sure it’s harder than ever to fit into that New Year’s dress you just bought…#sorrynotsorry. This New Year’s, you can nosh on delicious food, toss back some bubbly, indulge in some tunes and celebrate with friends at Diplomat Prime. They’re offering up a Prix fixe menu with Veuve Clicquot specials, plus live jazz music to set the scene. And when the clock strikes midnight, Diplomat Prime will help you celebrate in style with a special balloon drop and a champagne toast. Tickets/Reservations: The first seating is at 6 pm and is $175, and the second seating is at 9 pm and is $255. Reservation required. There’s something special about welcoming the new year from a chic rooftop with sweeping views of the city. And when it comes to Brickell, there’s no better spot for views than Sugar. Sugar will turn its rooftop oasis into a fairytale winter garden to ring in 2019. You can catch firework displays from all over Miami while dancing to beats by Lazaro Casanova and sipping on signature cocktails. Tickets/Reservations: General admission tickets are $80/per person and the party starts at 8 pm and goes until late. Email nye@sugar-miami.com to reserve your space. Want to be transported to Tokyo for one night only? Then Zuma is your go-to spot this New Year’s. The restaurant will be hosting an upscale dinner experience and terrace bash called “The Tale of Two Cities.” The “Tokyo Nights” tasting menu will include Zuma’s Japanese cuisine that we all know and love, accompanied by La Grande Dame Veuve Clicquot and Kirinzan Sake, starting at $195 per person (before 8 PM). For an fun, chic party atmosphere, the streets of Osaka will occupy Zuma’s panoramic, riverfront terrace with unlimited live tasting and drinking stations, DJ entertainment and much more. No need to travel to Italy to partake in a fancy, Italian affair to celebrate New Year’s Eve. At La Centrale’s Aperitivo Bar, guests can dance the night away while sipping on classic cocktails from the open bar for $120 along with a three-course prix fixe menu. Simultaneously at La Centrale’s epic wine bar, Enoteca, on the third-floor guests can partake in a classic Venetian masquerade ball including a delicious feast starting at $150. House music lovers – this one’s for you. Grammy Award-winning DJ and producer Benny Benassi will bring his universally renowned ‘electro-meets-house’ sound to W South Beach’s WET for a live concert New Year’s Eve party. Add in a premium open bar from 9 pm – 12 am and you’ve got yourself a party. Tickets/Reservations: GA tickets are $200 and VIP table service packages are also available. For more, visit http://wsouthbeachnye19.com/. If you’ve never spent a New Year’s Eve at the Fontainebleau, you are missing out. In true Fontainebleau style, they’re hosting another banger you won’t want to miss. 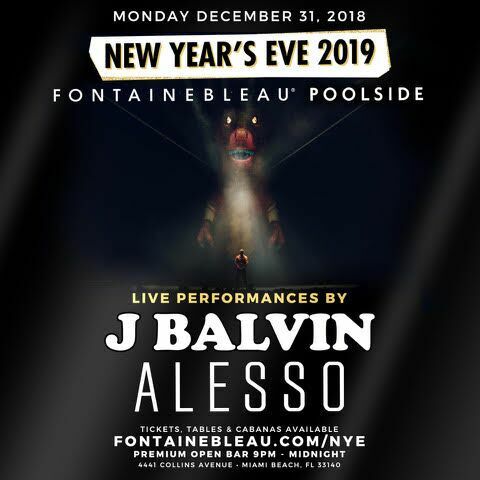 Guests can enjoy live music from J Balvin and Alesso, who will be performing poolside, along with a premium open bar until 12 am. Tickets/Reservations: GA tickets start at $225, which includes premium open bar until midnight. Private tables and stage-side private cabanas are also available and include premium beverage packages. Find out more and purchase your tickets here. For those who need a pick-me-up after a night of partying on New Year’s Eve, Jaya at the Setai is offering an extravagant New Year’s Day brunch special curated by Executive Chef Vijay Veena. There will be a lavish buffet spread, including several raw bar selections and desserts galore. Plus, add in free-flowing Louis Roederer Champagne and live jazz in the courtyard and you’ve got yourself a party. Tickets/Reservations: Brunch is priced at $145 per person and $63 per child (ages 5-12 years old) from 11:30AM – 3PM. Reservations are required and can be placed on Opentable, or by calling (855) 923-7899. ﻿Wishing you all a delicious end to 2018 and an indulgent start to 2019. And if on January 1 you’re in need of some hangover food, you know who to call!